My colleagues and I have been championing the message that emerging markets have changed—they are no longer just commodity plays. Old economic models are undergoing a transformation in many cases, opening up exciting new investment opportunities. Here, Carlos Hardenberg, executive vice president and managing director, Templeton Emerging Markets Group, explains how the changing consumer dynamic in emerging markets has driven the demand for new and innovative goods and services. While misconceptions seem to persist, the reality is that many emerging-market economies have expanded their scope—so we are glad to see investors begin to acknowledge this. Emerging markets are no longer one-dimensional. We are seeing the cultivation of a new generation of innovative companies located in emerging markets—diversifying emerging-market economies and the opportunities for investors. At the same time, the emerging-market middle class has been on the rise. Greater consumer spending power has driven local companies to meet the demand for newer types of goods and services. We think this trend will likely continue to drive emerging-market growth and innovation. The technology sector as a whole has changed the way we live. Back in 1982, the patent for the world’s first commercial compact disc (CD) player was snapped up in the United States and each disk retailed for about US$14. Now, with the likes of cloud technology, users can access millions of songs for even less—and with no physical record or disk required. 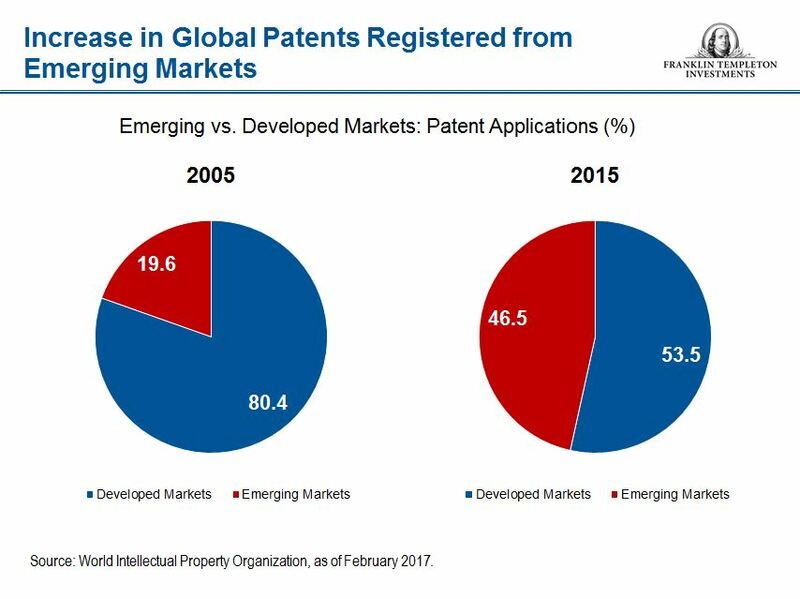 In addition, nearly half of global patent applications are now registered in emerging markets, which you can see in the diagrams below—technology has transformed emerging markets in a relatively fast timeframe. We believe many emerging-market companies have room to grow faster than many companies in the developed world. Not only are these emerging-market companies catering to a dynamic domestic consumer base, they are also gaining a larger share of global exports. 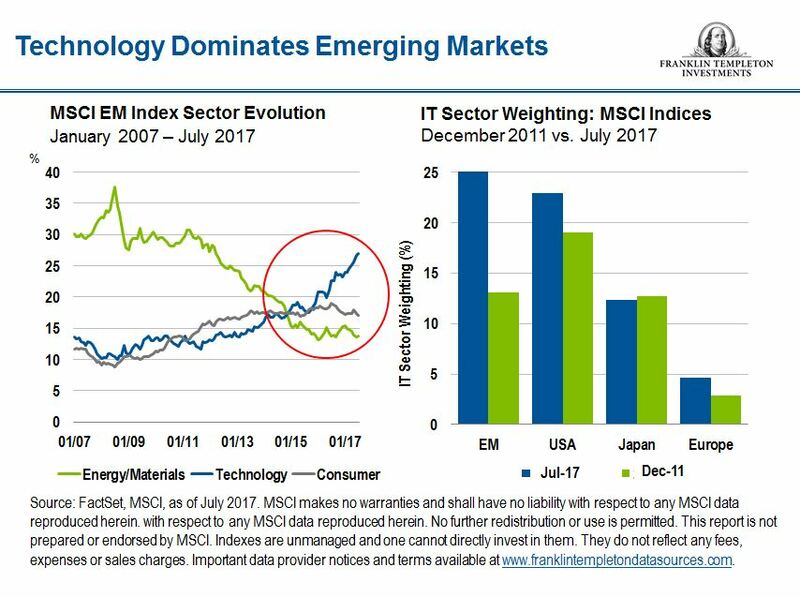 In our view, the technology sector in emerging markets remains underinvested. We see value in many areas, including e-commerce businesses in Central America, component developers in Taiwan and South Korea, and digital banking in South Africa and Asia. Many technology companies in emerging markets have been able to grow very quickly, with a competitive advantage tied to a fairly large market share. And, we think this growth could continue for quite some time. For us, technology is an exciting sector to watch. But, it’s the changing demographics in emerging markets that really drive demand for these types of goods and services. In our view, Asia is still one of the most exciting regions in emerging markets today. While commodity production and export remains vital to many economies, the region is worlds away from its commodity-only trade legacy, especially in China. China has moved from producing relatively low-end products to much more sophisticated ones. Today, the changing consumer dynamic means demand for new goods and services has pulled the manufacturing sector into new territory. Overall, we’re seeing a new generation of companies in emerging Asia moving into value-added production processes. Many of these companies have shown a high degree of innovation and sustainable growth. Still, while the more mature and larger economies in Asia can provide us with many potential opportunities, we also see a lot of interest in the smaller Asian countries, too. Generally, we are seeing growing and more diverse consumer bases in the Philippines, Indonesia, India and Vietnam. For example, Vietnam alone has seen gross domestic product (GDP) per capita rise from under US$300 in 1985 to more than $2,000 in 2016.4 Consumers are now looking for “newer” types of goods and services that suit their higher per household spending ability. We see emerging-market companies catering to this growing and changing consumption pattern with local brands and locally produced goods. Taking a holistic view of the Asia region, we can see that intra-Asian trading is becoming increasingly important. While there are some risks in the distance that need to be watched carefully, we think emerging-market stocks still hold much potential, especially if we step away from the idea that emerging-market investing is purely commodity-based. The most common misconceptions amongst investors surveyed involved assumptions surrounding volatility and risk—with 26% saying they had no emerging-market exposure because it was deemed “too risky.” We think that’s a shame! Whilst many investors may dismiss emerging markets as too risky, we think the potential rewards they can deliver over time should not be overlooked. In the current low-growth, low-yield environment, emerging markets can offer investors access to innovative, fast-growing companies trading at attractive valuations. All investments involve risks, including the possible loss of principal. Investments in foreign securities involve special risks including currency fluctuations, economic instability and political developments. Investments in emerging markets, of which frontier markets are a subset, involve heightened risks related to the same factors, in addition to those associated with these markets’ smaller size, lesser liquidity and lack of established legal, political, business and social frameworks to support securities markets. Because these frameworks are typically even less developed in frontier markets, as well as various factors including the increased potential for extreme price volatility, illiquidity, trade barriers and exchange controls, the risks associated with emerging markets are magnified in frontier markets. Stock prices fluctuate, sometimes rapidly and dramatically, due to factors affecting individual companies, particular industries or sectors, or general market conditions. The technology industry can be significantly affected by obsolescence of existing technology, short product cycles, falling prices and profits, competition from new market entrants as well as general economic conditions. 1. The survey was conducted on behalf of Franklin Templeton Investments by Opinium between July 31 and August 4, 2017. All figures, unless otherwise stated, are from Opinium Plc. The respondents were 1,001 UK adults who invest at least £25,000 (US$33,000) and do not take investment advice. The survey was carried out online. The figures have been weighted and are representative of all UK adults (aged 18+). 3. Source: FactSet, MSCI. The MSCI Emerging Markets Index captures large- and mid-cap representation across 24 emerging markets countries. Indexes are unmanaged and one cannot directly invest in them. They do not include fees, expenses or sales charges. Additional data provider information available at www.franklintempletondatasources.com. 4. Source: The World Bank, GDP per Capita, current US dollars. 5. Survey conducted on behalf of Franklin Templeton Investments by Opinium between July 31 and August 4, 2017. All figures, unless otherwise stated, are from Opinium Plc. The respondents were 1,001 UK adults who invest at least £25,000 (US$33,000) and do not take investment advice. The survey was carried out online. The figures have been weighted and are representative of all UK adults (aged 18+).